The Agricultural Act of 2014 (the 2014 Farm Bill) is scheduled to expire with the 2018 crop, fiscal and calendar years depending on the particular provision. The earliest of these is the federal fiscal year (FY) that ends September 30, 2018. Both the House and Senate have passed versions of a farm bill but they remain stuck in conference negotiations due to a stalemate over key provisions in the bills. The stalemate is caused by three intersecting issues. Each will be examined separately, beginning with a look at the issues with commodity assistance, followed by a discussion of the impasse over the Supplemental Nutrition Assistance Program (SNAP) and then conservation. Expiration of the 2014 Farm Bill is complicated and will impact different programs in different ways. For example, crop commodity programs expire with crop year 2018 and if Congress does not reauthorize the programs or extend existing programs commodity assistance is scheduled to revert to the parity system of the Agricultural Act of 1949. Crop insurance, by comparison, is permanently authorized and is not impacted by expiration. For SNAP, the benefits are generally authorized on a permanent basis but authorizations for funding parts of the program expire with the 2018 fiscal year. Appropriators, however, are expected to continue funding program operations so long as the Federal government remains open. For conservation programs, the authority to enter into new contracts will expire with the fiscal year (September 30, 2018) but programs and existing contracts will continue. A large number of programs expire on September 30, 2018, and, without a new farm bill, an extension of the 2014 Farm Bill, or some other action by Congress, the funding and authorities for these programs can be at risk (Monke, 2018). These include all programs authorized for appropriations, although passage of a continuing resolution or other appropriation bill would continue operation. Even if a continuing resolution is passed, however, 39 programs with mandatory funding of $2.8 billion (over five years) will lapse at the end of the fiscal year unless Congress passes a new farm bill or extends the current farm bill. Among these programs are the Foreign Market Development Program and Technical Assistance for Specialty Crops, as well as the energy title programs and the beginning farmer and rancher development program in the Research title. Some of the assistance for socially disadvantaged and veteran producers would also expire, as would rural water and waste authorities and the value-added market development grants. Lower crop prices have been the defining concern in the debate over the farm support system in Title I (commodities) and crop insurance. Figure 1 illustrates the monthly average prices received by farmers since January 2007 as reported by USDA’s National Agricultural Statistics Service (NASS, Quick Stats) for four of the major crops (corn, cotton, soybeans and wheat) supported by the farm bill. This time frame covers much of the era in which the Renewable Fuels Standard (RFS) has had a significant impact on crop markets and prices. 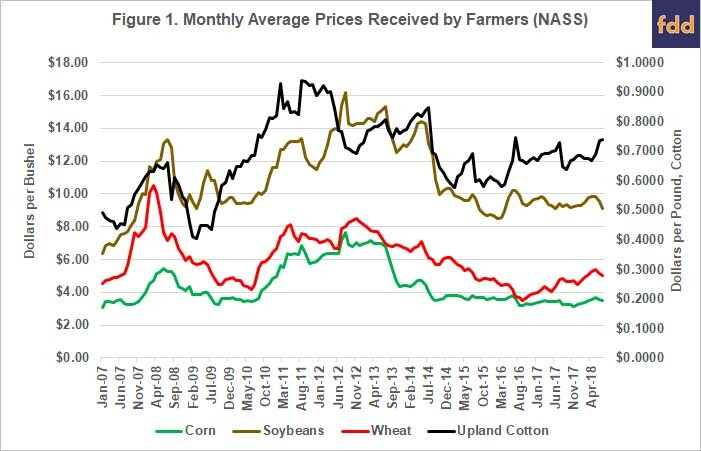 Figure 1 indicates the general decline in prices for these four crops but it also highlights that only cotton has experienced an increase in recent months. To add further perspective, Figure 2 illustrates the estimated average revenue per acre obtained from the market. It is calculated using the marketing year average price (MYA) and national average yield as reported by NASS. For 2018, the revenue is estimated by using the projected yield and mid-point of the projected price as reported in the World Agricultural Supply and Demand Estimate (WASDE) produced by USDA (USDA WASDE, Latest Report). 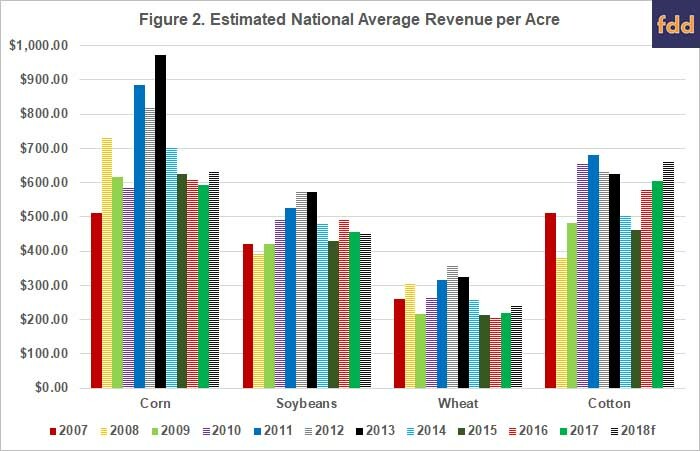 Average revenue per acre for all four crops has fallen from the recent peaks. Current projections are for improved revenue for the 2018 crops of corn, wheat and cotton but not for soybeans. Lower prices (Figure 1) have been much of the story for the commodity support portion of the farm bill debate; multiple big crops applying downward pressure on prices and, in 2018, additional downward pressure has been attributed to the tariff and trade conflicts (farmdoc daily, August 16, 2018). Figure 2, however, also serves as a reminder that prices are not the entire story; strong yields can support revenues even when prices are low. To add further perspective to the revenue comparison, Table 1 compares revenues in each of the farm bill years (2014 and 2018 forecast) to the five-year Olympic average of revenues for the years leading up to the farm bill years (2009 to 2013 and 2013 to 2017, respectively). While all four crops are in a relatively better revenue position in 2018 compared to 2014, the forecast for cotton revenue would place that crop in a significantly improved situation as the 2018 forecast is 117% of the five-year Olympic average (2013 to 2017). Because lower prices and revenues can trigger payments from ARC and PLC, one place impacts would show up is in the Congressional Budget Office (CBO) forecasts. Table 1 provides a comparison of payments estimated for the 2018 crops of corn, soybeans, wheat and cotton. The first two columns compare CBO’s estimates for payments from ARC, PLC, and Loan Deficiency Payments (LDP) programs for the 2018 crop. Specifically, this compares payments forecast by CBO in the June 2017 Baseline with those forecast in the April 2018 Baseline, although the latter predates the impact of the tariff conflict. Note that due to timing shifts in the last farm bill, 2018 crop year payments in ARC and PLC will not be made until FY2020 (CBO). The final columns in Table 1 add in the Market Facilitation Payments recently announced by USDA for each of these crops (farmdoc daily, August 28, 2018; USDA, Press Release, August 27, 2018) and the cotton ginning cost share assistance programs announced by USDA in March 2018 (USDA FSA, Cotton Ginning Cost Share Program). Payments for the 2018 soybean and cotton crops certainly stand out. Soybeans—expected to bear the brunt of the tariff conflict with China—are receiving the largest share of USDA’s MFP for 2018 (estimated $3.6 billion). The increased spending on the 2018 cotton crop comes from three sources: (1) addition of seed cotton to the list of covered commodities eligible for ARC or PLC payments for the 2018 crop ($363 million estimated by CBO); (2) cotton ginning cost share payments (estimated $227 million); and (3) the MFP (estimated $277 million). Figure 3 illustrates the additional revenues expected from government payments for the 2018 crops of corn, soybeans, wheat and cotton. 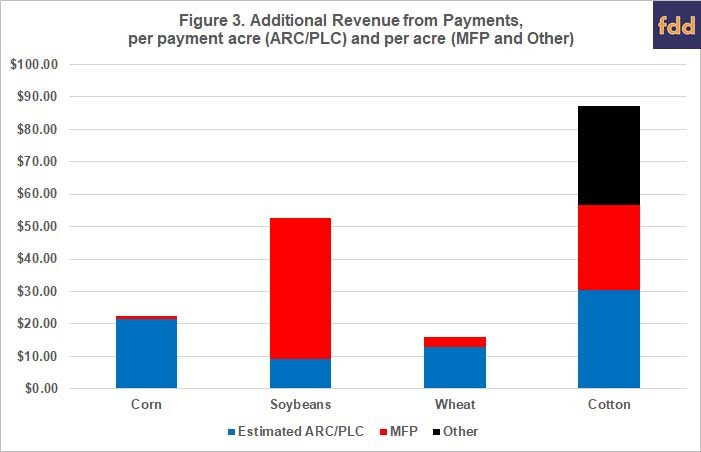 The ARC/PLC payments are estimated using the April 2018 CBO outlays for FY2020 per payment acres (85% of base), using 80% of generic base to represent seed cotton base in ARC/PLC. CBO does not indicate LDP for any of the crops in 2018. The per-acre MFP is calculated using the payment rate multiplied by national average yields. Cotton ginning assistance is the average of the regional payment rates announced by USDA. Combined, this information produces a rather striking picture for cotton. The 2018 revenue forecast for the crop is above the average revenue in 2014. Cotton also has the highest revenue relative to recent years as measured by the five-year Olympic average (117.23%). On top of that, cotton will receive by far the most in payments as measured on a per-acre basis. All of cotton’s payments, it should be noted, are from payments that were not authorized by the 2014 Farm Bill because cotton was removed from ARC/PLC in that bill in response to the Brazil WTO dispute. Aside from the obvious differences in revenue by crop, the payments also add perspective to the debate over payment limits and eligibility requirements. The House and Senate disagree on whether additional managers listed in a farm entity can receive payments, as well as the limits on how much farmers can receive. These differences include issues about whether to permit an increase in the number of farm entities that can receive payments, as well as an increase the amount of payments those entities can receive. Additionally, the CBO scores of the House farm bill raises additional questions. Buried within Title I of the House farm bill is a one-time opportunity to update payment yields for all crops—which would increase PLC payments—but on a limited regional basis. The option is available only for farms in a county rated as having been in exceptional drought for 20 or more consecutive weeks from 2008 to 2012. 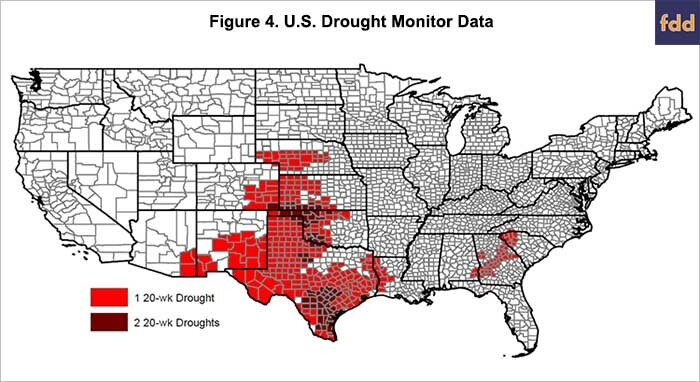 Figure 4 maps the counties that would qualify for the yield update pursuant to the House language using data available from the National Drought Mitigation Center (U.S. Drought Monitor Data). These counties could update yields to 90% of the simple average of yield per planted acre for the 2013 to 2017 crop years. CBO analysis of these provisions indicates that cotton farmers would receive an additional $577 million in PLC payments over 10 years; spending partially offset by reductions in spending for other crops, as well as for ARC-CO seed cotton payments (CBO Cost Estimate, April 13, 2018). CBO analysis also indicates that the increased spending for this regionally-limited yield update is net of a partial offset; the offset is from a provision that would prevent payments to any farmer who did not plant program crops on base acres during the 2009 to 2017 crop years (CBO Cost Estimate, May 2, 2018). Figure 5 maps an initial estimate of where acres would be most likely to lose payments under the House provision. Figure 5 compares the average planted acres for all covered commodities (2009 to 2017) by State to all base acres (2015) in the State. 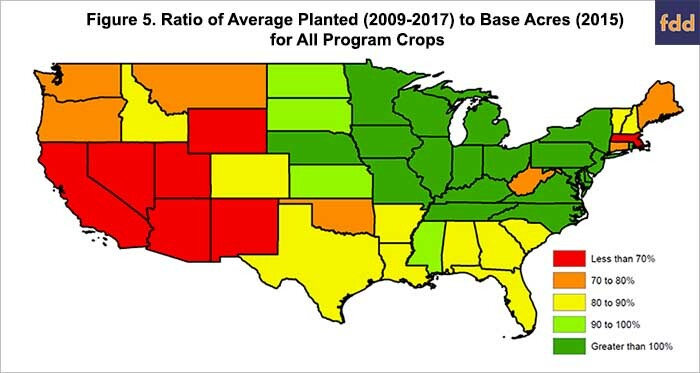 States where average planted is less than base (e.g., less than 100%) are the most likely to have unplanted base acres that could be subject to the House provision. This is a very rough estimate, however, because the provision would apply on a farm-by-farm basis, eliminating payments on those farms that have not planted any covered commodity in those years. Figures 4 and 5 raise questions about these provisions in the House farm bill. First, the House yield update is unusual. The 2014 Farm Bill provided a one-time opportunity to update payment yields for all crops and regions to 90% of the average yield per planted acre from 2008 through 2012, as well as a plug yield of 75% of the county average yield if farm yields were below it. Upland cotton, no longer a covered commodity in 2014, would not have updated payment yields. When Congress added seed cotton in the Bipartisan Budget Act of 2018, however, it also provided farms with upland cotton yields the opportunity to update upland cotton yields using the 2014 calculation (90% of the average for 2008 to 2012) and seed cotton was given a multiplier of 2.4 times the updated upland cotton payment yield. It is not clear why an additional yield update was included in the House 2018 farm bill and it is less clear why it is on a limited regional rather than national basis. The final question is the impact of the offset provisions and whether farmers in counties that are unable to update yields are being required to “pay for” the regionally-limited updated yield by having payments eliminated on unplanted base acres. These questions certainly could have implications for the stalemate in conference negotiations (Brasher, September 26, 2018). That Congress will complete work on a farm bill by the September 30th fiscal year deadline appears highly unlikely. This could put at risk funding for several programs that will lose authorization at the deadline but Congress has the ability—short of a completed farm bill—of avoiding the worst outcomes, including by extending the 2014 Farm Bill. The conference negotiations appear to be at a stalemate and this article reviewed how the farm economic situation and commodity support policy could be a factor in that stalemate. Specifically, one hurdle going into the 2018 debate was the demand by the cotton industry to return its base acres to farm payment programs after having been removed in 2014 in response to the Brazilian WTO dispute. Adding back cotton was expected to come with political challenges because it would have required offsets to stay within budget rules; complicating already-difficult politics under lower prices by moving funds among commodities or titles. Congress, however, added seed cotton outside of the farm bill and USDA has delivered two different payments to cotton farmers for the 2018 crop. For conference, these initial concerns appear to have been reversed. The concern is now whether the 2018 payments to cotton have freed cotton supporters in Congress to pursue controversial changes to SNAP and conservation programs. There are also questions about whether an unusual yield update and its offset are adding further complications. Finally, the promise of payments from USDA could be a hindrance as well; billions in Market Facilitation Payments and the potential for billions more could dampen farmer demand for a farm bill. Brasher, P., “Commodity program dispute stalls farm bill,” Agri-Pulse, September 26, 2018, https://www.agri-pulse.com/articles/11468-commodity-dispute-remains-unresolved-as-farm-bill-stalls. Coppess, J., C. Zulauf, B. Gramig, G. Schnitkey and N. Paulson. "Conferencing Conservation: Reviewing Title II of the House and Senate Farm Bills." farmdoc daily (8):133, Department of Agricultural and Consumer Economics, University of Illinois at Urbana-Champaign, July 19, 2018. Zulauf, C., J. Coppess, N. Paulson and G. Schnitkey. "The Tariff Conflict and Change in Value of Production of U.S. Field Crops." farmdoc daily (8):153, Department of Agricultural and Consumer Economics, University of Illinois at Urbana-Champaign, August 16, 2018.